Wait, what? Hold up a second y'all, was it ever gone...?! Double denim has always been a frigging awesome trend in my eyes. So who cares if it's gone, back, here forever, or dared to never be seen again, if you love it, rock it. And if you don't, well, don't, I guess. Oversized denim JJ's rocking alongside denim cut offs have always been a personal fav of mine. My mum forbids me to wear the jacket, since it has a huge Ol' rip in the shoulder due to the strain of my bag strap, but mumma I don't care and I never will so please stop with your denim threats. Why have people always dissed it? Did Britney and Justin's denim duo look scar people for life? Or is it simply a bandwagon thing, one celeb ripped the trend to shreds and no ones dared to try it since, either way, I'ma take this shizzle to town. These gorgeous ripped jeans seem to be back online everywhere. It's like they hibernated over the winter and are back for a mouthful of spring. I missed my chance in the autumn months since they were in pretty high demand, so I was lucky to get my mitts on them this time around. The shirt? Ah, that's a whole different story. There was this one guy last September at a boot sale, a fishermen looking guy I believe, (well, he was selling lots of fishermen camo) I saw this on the rail, and left it. Although whilst I continued to walk round I couldn't get this piece of over-oversized denim off of my mind. I pestered Jack to run back for a price, (I'm not no good at bartering at carboots) and that was it, Jack came back, in the bag for £2. You know I love all things affordable right. And me & the shirt lived happily ever after, the frigging end. Otherthan the different coloured, size & textured denims that are layered in this outfit, I'm pretty crazy over this bag right now. I posted it on Instagram a few weeks back and the photo did not do it justice at all, neither did videoing it for my Primark haul outside last week. But, luckily I caught the sun on a good day last week and it gave the holographic rucksack all of the justice it could ever need. Nicely done Primark, this is such a great bag for a tenner. Damn, I've really blabbered on in this blog post haven't I? I hope you've all enjoyed reading it. I've been finding it a lot easier to write my posts when I'm away from the laptop and sitting elsewhere. Your bag is amazing!! I love it. You look great. Amazing outfit. I love the DD and your shoes are gorgeous. I'm just bloody in LOVE with your style! That is all. 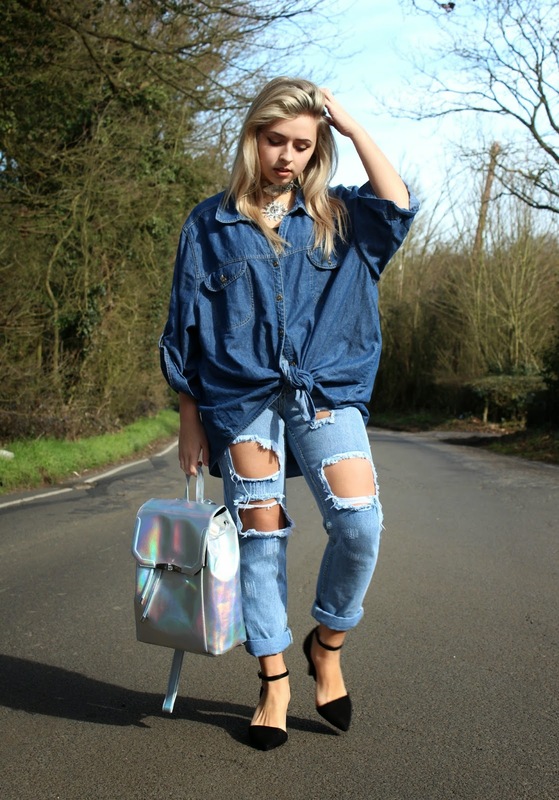 I've always loved double denim and think it looks so chic when worn right! You look amazing! Girlllll, this look is amazing. 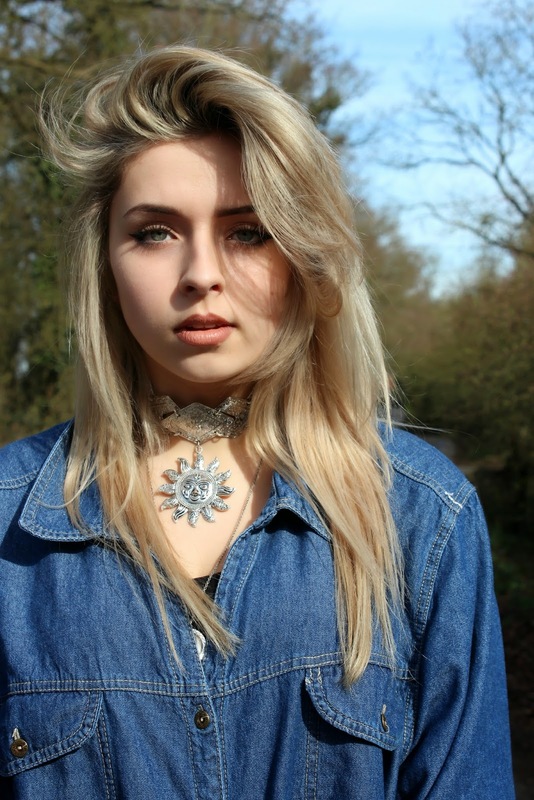 I love your style - found you on youtube and stalked out your blog haha!